Shayla Who? 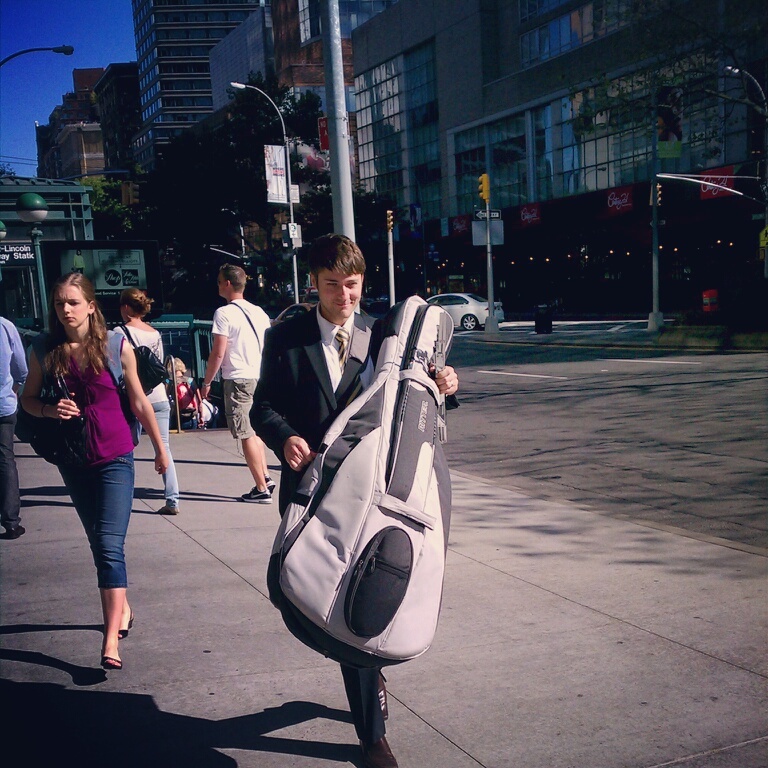 : black & cello & one year thoughts. i can't believe we've lived in new york city over a year now. a year! i still remember (with a shudder) our first few days here like it was flippin' YESTERDAY. it was around this time one year ago that we had no furniture...no bedding...no food...& no NOTHING for the kitchen (we used plastic knives to make pb&j sandwiches & ate them off napkins! that was our ONLY FOOD). we didn't know anyone. we missed our great group of friends & the familiar territory of provo, utah. we didn't know how to use the subway. we didn't know how to get anywhere once we were actually on the subway. we didn't know you aren't supposed to make eye contact with the crazies. we hardly remembered how to get home again once we found anywhere to go. it took us forever to find where church was on sunday. the city was one loud, smelly, & completely overwhelming ratball...wow. what a time, i tell you, WHAT A TIME. it was awful & horrible & only about 7% exhilarating, & that was only because we were going through it together, my wonderful man & i, as an awesome little team. i'm pretty glad that whole moving-in part of our life is over...i'm breaking into a bit of a cold sweat just thinking about it! [read more about it HERE, how much of a nightmare packing was in provo HERE, husband's last day of pre-phd freedom HERE, & funny times when we bought things for our new apartment HERE] when i remember all the craziness we went through in our first few days & weeks here, i'm amazed that we actually made it through alive. because, let me tell you, there were plenty of opportunities in there when it would have been so easy to just cut our losses & give up. but here we are! one year under our belts, & many more to go. show us what you got, new york! show us what you got. dress: thrifted, belt: thrifted, shoes: payless. today in church husband & i did a musical number! i played the piano, husband cello-d the audience's socks off, & a friend of ours sang. we were worried about it, but we ended up being really happy with the final product. 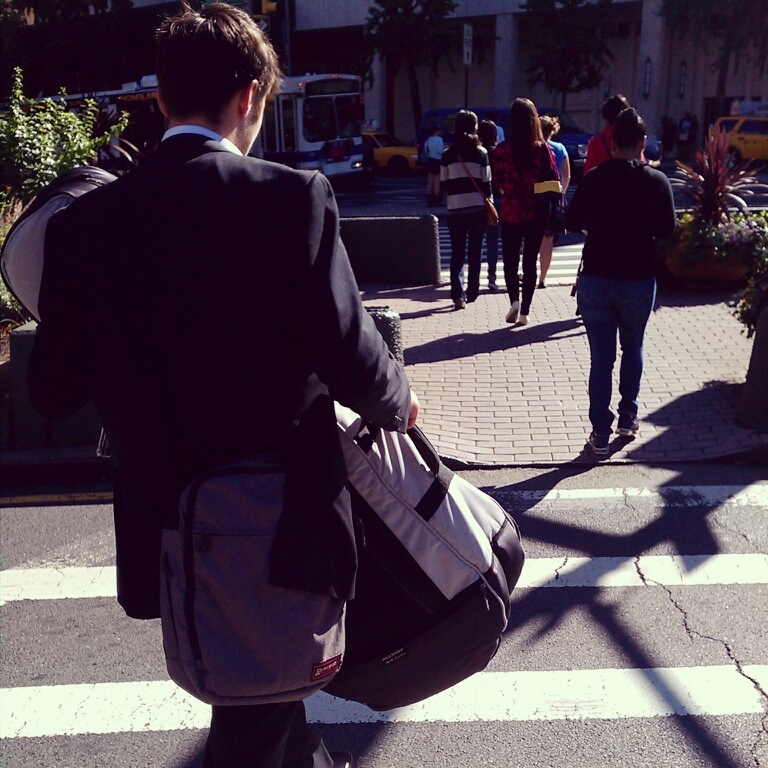 i couldn't help but snap a few candids of ben carting his trusty instrument to & fro. hope your sunday was a dream!